Sometime in late May, early June a star decided that’s its time was up. The largest explosions in nature, supernova occur when massive stars use up all their nuclear fuel. They collapse on themselves and the increase in pressure once again triggers fusion. This results in a massive explosion, first theorized by squirly Caltech Physicist, Fritz Zwicky. To paraphrase Bill Bryson, supernova are very important for a lot of reasons, the least of which is that without them, we wouldn’t be here. Nuclear fusion is a weird thing. After burning Hydrogen, Helium, Lithium, and elements up to and through Iron, suddenly more energy is required than given off by the reaction. Only in the brief moment where the collapse of a star results in these cosmic explosions are heavier elements created. That’s a big part of the reason why these elements are so rare. Sometimes they’re rare and valuable… think Gold, or Platinum! 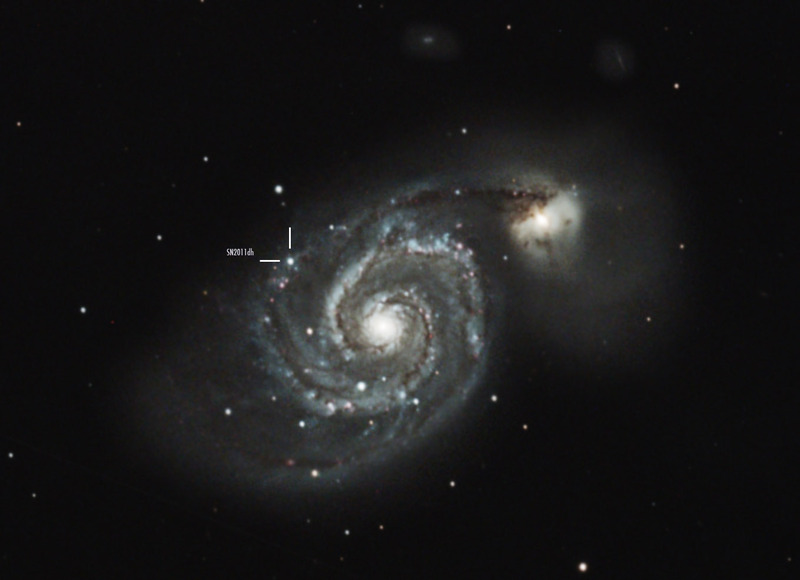 This image was a total of 15x 10 minute subs taken with the AstroTech AT10RC. Captured in MaximDL, stacked and calibrated in Nebulosity, and then processed in CS5. This entry was posted by admin on June 5, 2011 at 8:26 pm, and is filed under Galaxies. Follow any responses to this post through RSS 2.0.You can skip to the end and leave a response. Pinging is currently not allowed.